Working on both the Daoguang edition of the original text printed in the early 19th century and the identical version, published in the early twentieth century under the editorship of Mao Xiang’s descendent, the erudite scholar Mao Guangsheng (1873-1959), and drawing on the translators’ previous research on Mao Xiang and the late Ming literati, this book offers a truthful rendition of the Chinese masterpiece. It identifies essentially all the historical figures who appear in the memoir and provides ample explanatory notes. To help readers understand the context of the book, the translators have provided photographs of some of the places mentioned in the memoir, which they took during their visits to East China in 2018. Also included are examples of Mao Xiang’s calligraphy and Dong Xiaowan’s painting. 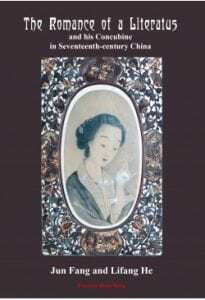 This book is both the first translation of Yingmeian Yiyu into English since 1931 and a valuable resource for studying Chinese history, literature, and gender relations in the seventeenth century. The Romance of a Literatus and his Concubine in Seventeenth-century China should appeal to a wide readership of students, specialists, and interested laypersons. Jun Fang 方駿 received his Ph.D. in History and East Asian Studies from the University of Toronto. He is Professor of History at Huron University and Adjunct Research Professor at the University of Western Ontario. Prior to joining the faculty at Huron in 2005 he taught Chinese history at Nanjing University (1987-1989) and the Education University of Hong Kong (1995-2005). He has published twelve books including China’s Second Capital – Nanjing under the Ming, and is completing a book-length manuscript on “chaste women” in Ming China. Lifang He 何麗芳 received her Ph.D. in Chinese Linguistics from Shaanxi Normal University and is Assistant Professor of Chinese at Huron University. She taught Chinese language and culture at the Education University of Hong Kong from 1998-2005 and has been teaching Chinese language and cinema at Huron since 2005. She is the author of Duoyuan Wenhua Yujing Zhong De Hanyu Yuyin Xide 多元文化語境中的漢語語音習得 (The Acquisition of Chinese Phonetics in the Context of Multiculturalism).